Silverleaf nightshade (Solanum elaeagnifolium) is a weed that reduces production in crop and pasture enterprises throughout the Australian wheat-sheep zone. It is a long-lived perennial plant with very deep, resilient roots. It grows during spring and summer and uses valuable moisture and nutrients needed for following crops and pastures. Silverleaf nightshade (Solanum elaeagnifolium Cav.) is a declared weed in New South Wales, Victoria, South Australia & Western Australia and was listed as one of the Weeds of National Significance in 2012. Read more about ** Best Practice Tips & Tactics for Silverleaf Nightshade Control ** now available! Attached in PDF format below are three recently added SLN documents for your general information and interest. The first attachment is a laboratory summary of SLN nutritional feed quality conducted in Wagga Wagga, based on field samples taken from a working farm in the Riverina region, NSW. The second article originates from Mexico and investigates the replacement value of SLN for alfalfa offered to growing goats. Silverleaf Nightshade Survey. We need your feedback! Please complete just SIX questions. Survey is anonymous. Read more about Silverleaf Nightshade Survey. We need your feedback! Please complete just SIX questions. Survey is anonymous. With spring almost upon us, we'd like to know of any farmer/landcare groups that are interested in learning more about quality management techniques for tackling silverleaf nightshade in their area. The silverleaf nightshade team offer half day on-farm workshops that feature up to date research on management of this common summer growing weed as well as answering questions from participants about the best control options for the local area. 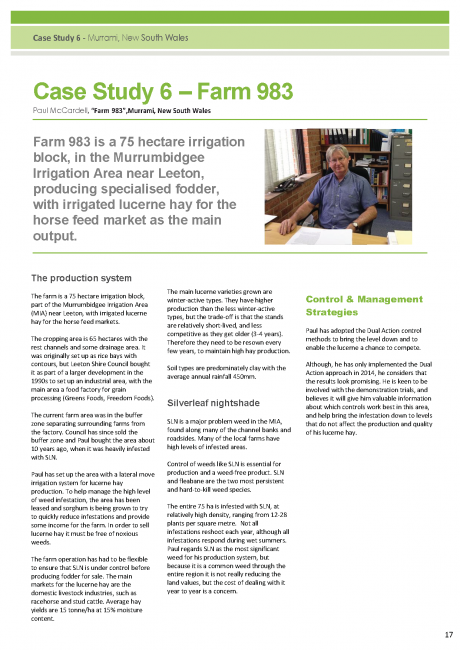 The results from 366 on-farm trials established across Vic, NSW, SA & WA can also be presented.